The Republican Party can now boast 15 confirmed candidates in the 2016 race for the White House, since Wisconsin Governor Scott Walker announced he's running for president Monday morning. "I'm in," he wrote on Twitter. "I'm running for president because Americans deserve a leader who will fight and win for them. - SW." The post preceded his expected announcement later on Monday at the Waukesha County Expo Center in Wisconsin. Tickets were first released for the event, titled "An Announcement From Governor Scott Walker," on Wednesday, July 8, via an Eventbrite page, indicating the candidate's embrace of technology to get his message across. Walker's campaign rollout fittingly began via social media on Thursday, July 2, when the governor's staff tweeted out a teaser image. Walker then unveiled the first Instagram photo in a nine-part series of what ultimately makes up his campaign logo. The "Scott Walker for America" logo was completed over a week later, on Friday, July 10. Walker's presidential announcement comes shortly before the county fair kicks off at the Waukesha County Expo Center. From there, Walker is heading to Las Vegas on Tuesday to begin campaigning across the country. Despite only recently announcing his candidacy, it appears that Walker is in good favor with Republican voters. According to a June GOP poll from Public Policy Polling, Walker was leading the pack with 17 percent popularity, with Jeb Bush polling at a close second, at 15 percent. The conservative first rose to national prominence in 2011 after the passage of Wisconsin Act 10, legislation created by Walker that limited collective bargaining and union rights in the traditionally progressive state, among other restrictive stipulations. The bill was crafted to address a state deficit that totaled $3.6 billion at its highest, and was wildly contentious, given its anti-union sentiment, prompting detractors to seek a recall election against Walker. 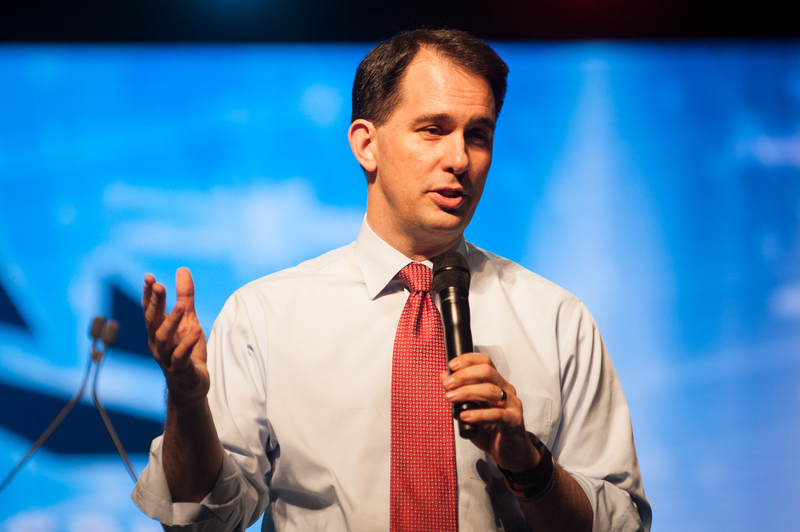 Walker subsequently survived both a 2012 recall election and a gubernatorial election in 2014, and is currently serving his second term as governor. Likewise, the state's supreme court ultimately upheld Wisconsin Act 10 in 2014. Walker's latest foray into labor law issues has been the signing of a law that changed Wisconsin into a "right-to-work" state, ultimately preventing private sector workers from being forced to pay union fees. The GOP candidate will undoubtedly be playing up those victories as key components of his presidential campaign.